Big Pharma’s skyrocketing prices are finally in for some real scrutiny by the U.S. Government Accountability Office (GAO), as well as new initiatives in the Maryland and New York statehouses. The GAO—the independent, nonpartisan agency that works for Congress and often is called the “congressional watchdog”—has announced that it soon will undertake an investigation requested by three members of Congress of abuses of the federal Food and Drug Administration’s Orphan Drug Act. That act is supposed to spur Big Pharma to develop drugs for “orphan diseases,” illnesses that affect fewer than 200,000 Americans. Drug makers have resisted investing time and money on therapies for these diseases because the medications may offer insufficient financial returns. So, Congress granted tax incentives and limited exclusive rights to makers of drugs targeted at patients with niche diseases. But Kaiser Health News Service, among others, has published investigations indicating that drug makers have exploited the Orphan Drug Act for financial gain. Companies have taken old medications, provided limited test information about their benefit for rare diseases, then reaped profits by jacking up the drugs’ prices and profiting from tax incentives and exclusive rights on them. Kaiser found that a third of FDA drug approvals involved medications already given the green light for mass markets and simply re-purposed. The FDA also is approving multiple meds as orphans, sometimes as many as 80 different drugs for one rare disease. Makers are turning with greater frequency to this FDA classification, with just under half of all the new drugs approved being deemed as orphans. Seven of the 10 top selling medications have been designated as orphans. Business Insider, joining Kaiser, has published a take-out about the curious goings-on with H.P. Acthar, a “blockbuster” anti-spasmodic that Mallinckrodt Pharmaceuticals acquired recently and is selling as an orphan treatment for 18 diseases. The online business information site says Uncle Sam in 2015 shelled out more than “half a billion dollars on a $38,000 [-a-year], non-lifesaving drug with a wide range of cheaper alternatives, making it one of the top 20 expenses for Medicare Part D, a prescription drug program. What’s more, according to a study by doctors at Oregon State University, this drug is prescribed by less than 1 per cent of doctors” in the United States. BI traces the big prescribers of this drug, finding they are recipients of Mallinckrodt speaker fees and serve as investigators of the medication’s use for various illnesses—studies that belie the reality that for many “rare” diseases for which it is now prescribed, and in sometimes hefty doses, there are much cheaper options, some at 1/40th the cost and with equal effectiveness. Citing consulting firm EvaluatePharma’s 2017 report on these products, Kaiser noted that orphan meds have gotten hot with Big Pharma, and are “expected to comprise 21.4 percent of worldwide prescription sales by 2022,” driven in part by sky-high prices that makers can charge for these meds. Of the top 100 drugs in America, the average cost per patient per year for an orphan drug was $140,443 in 2016, compared with $27,756 for a non-orphan. Such soaring drug prices have drawn fire from lawmakers in Annapolis and Albany, where Big Pharma has battled furiously against proposed legislative curbs. The House of Delegates in Maryland has approved a bill requested by Democrats and Attorney General Brian E. Frosh to try to rein in drug companies that seek to “price gouge” the public. Specifically, the makers of generic drugs deemed “essential” would be required to provide the AG notice if it intends to jack up the med’s price by 50 percent or more. The attorney general then could take the maker to court where a judge could determine if the price hike is “unconscionable,” and, potentially, could roll it back, order consumer refunds, and issue fines for the maker. 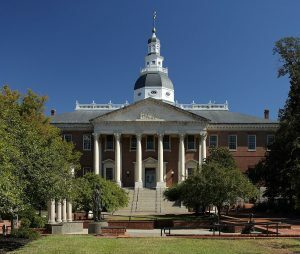 This measure has been moving, slowly, through the Maryland state house since its introduction in January. It has undergone much change, including successful Big Pharma efforts to sharply cut back earlier proposals for records-keeping and financial disclosures. The measure goes to the Senate, with an uncertain fate, especially because the legislative session has only a few more weeks to run, and senators have only conducted one hearing on the drug pricing measure. Meantime, in Albany, Gov. Andrew Cuomo is wrangling with Big Pharma over his announced, three-part push to curb skyrocketing prices for New Yorkers. In his 2017 budget plan, he called for state moves to bar price gouging in the Medicaid health program for the poor, as well as efforts (surcharges) targeted at drug makers whose prices are higher in New York, and new curbs on pharmaceutical middle-men, so-called pharmacy benefit managers. Big Pharma has assailed Cuomo’s plans, attacking them, for example, by arguing how these measures might harm New York’s efforts to become an international life sciences research capital. The initiatives by the GAO and in Albany and Annapolis are attracting national political attention, partly because, aside from occasional blustering about soaring drug prices (including during the ferocious efforts to repeal and replace the Affordable Care Act, aka Obamacare), President Trump hasn’t gotten far in taking any action. Indeed, as I have written, he thundered about Big Pharma “getting away with murder” with prices, then met with major drug company CEOs and turned sheepish about any regulation of the industry. In my practice, I see the huge harms inflicted on patients seeking medical services, and how much damage dangerous drugs can do. I see how expenses for medical care can be crushing to all too many Americans—soaring drug costs are among the top drivers of relentless increases in medical costs. Medical debt, in turn, is one of the leading causes of bankruptcy. No one begrudges Big Pharma from making a reasonable return on the pricey investment to develop and market potentially life-changing medications. But it doesn’t help the industry when it can’t stay out of the spotlight with not only exorbitantly priced but also malfunctioning products like the EpiPen. And, of course, runaway prices combined with costly and incessant marketing (and hype) and Big Pharma’s ceaseless avarice are simply unacceptable.